How about a construction update? A gas centrifuge cascade at the former K-25 Site shows that the technology works on a grand scale. ORNL�s largest cooperative R&D agreement is a homecoming, of sorts, for a technology that was developed largely at Oak Ridge, involving ORNL scientists and engineers. The Laboratory and USEC Inc. are working together to upgrade gas centrifuge operations with the aim of providing the United States with a state of the art domestic capability for uranium enrichment. Doug Craig is heading the ORNL side of the project that will take a uranium enrichment technology developed in the 1960s and 70s and inject the technical advances of the ensuing decades. USEC is managing the project, which involves upgrading facilities at the former gaseous diffusion plant in Portsmouth, Ohio, to house the American Centrifuge Demonstration Facility. Gaseous diffusion, which supplanted electromagnetic enrichment (Y-12�s calutrons) at the end of World War II, is becoming economically obsolete. The gaseous diffusion process uses 20 times the power that gas centrifuges require to produce the same amount of product. The United States had three gaseous diffusion plants�the Oak Ridge Gaseous Diffusion Plant (Oak Ridge�s former K-25 facility), Portsmouth and Paducah, Kentucky. ORGDP closed in 1985; Portsmouth ceased operations about two years ago. Paducah is now the sole domestic source for enriching uranium for reactor fuel, �and it�s getting old,� Doug says. Just a few years ago an oversupply of enrichment capacity, coupled with a reduction in demand brought on by events such as the Three Mile Island and Chernobyl accidents, took the impetus away from producing more fuel. A multinational company, URENCO, is currently a producer of enriched uranium, as are France and Russia. Other sources include downblended, highly enriched uranium from Russia, another program managed by USEC called the �Megatons to Megawatts� program. One current incentive for reestablishing uranium fuel production is national security�most producers are now offshore, and the market is stiffly competitive. �We have to come up with a more economical process,� Doug says, and recent technological advances may be just that�potentially separating uranium at costs that are well below current market prices. In 1999 USEC began exploring potential deployment of centrifuge technology to replace gaseous diffusion. USEC evaluated foreign centrifuge options, as well as the resurrection of U.S. centrifuge technology. In 2000, USEC established a project office in Oak Ridge, where it evaluated and planned for a couple of years. In June 2002, following a comprehensive agreement between USEC and DOE, USEC began seriously ramping up the program. Here�s how gas centrifuge works, very simplified: Uranium hexafluoride is spun in a rotating column. The U-238 is flung closest to the wall. Then comes U-235, which is extracted�essentially scooped out. Centrifuges are connected in series and parallel to form �cascades,� producing the desired capacities and enrichment levels. �In concept, it�s easy. In reality, it�s tough to do, and tough to do economically,� Doug says. In concept, the gas centrifuge process is easy. In reality, it�s tough to do, and tough to do economically. 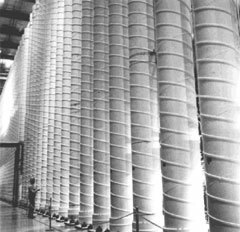 Doug says the centrifuge program of the �80s solved its materials problems by using fiberglass, which was conveniently strong and lightweight. Gas centrifuges with fiberglass rotors were available in 1985�Portsmouth had more than 1300 centrifuges installed and more than 700 operating�but the technology had its limitations. �The first exciting opportunity to take advantage of since 1985 is the advances in carbon fibers, which give us an entirely new ability to produce separation components. We can now take advantage of these new materials,� Doug says. �The third advantage we now have is advances in power electronics. Motors are now cheaper and more reliable,� Doug says. USEC came to Oak Ridge with a proposal to update centrifuge technologies using old designs and in some cases old equipment. The CRADA with the Lab will provide USEC with the horsepower to revamp the process using new technology and demonstrate a lead cascade�a series of centrifuges hooked together in numbers to produce the desired enrichment through a more economical process. That initial demonstration will be at the Portsmouth plant in Ohio. The centrifuge process was largely developed at K-25, involving many ORNL scientists. After the lull in uranium enrichment, some of the composite technologies that emerged from the work were directed toward flywheels and other advanced light-weight materials programs. That technology is now being directed back toward producing reactor fuel. The United States currently has 103 nuclear reactor plants producing 20 percent of the nation�s power. That percentage could grow as the nation strives for energy self-sufficiency. ORNL is currently devoting about 35 staff members, full and part-time, to the gas centrifuge CRADA with USEC. �Materials, engineering analysis, fluid dynamics, power electronics, instrumentation and controls�there aren�t that many places you can go and tap these different disciplines and then tap into gas centrifuge experience,� Doug says.�B.C. ORNL Director Bill Madia told the staff on April 28 that his time at the Lab is almost up. He�ll return to Battelle�s corporate headquarters in Columbus, Ohio, to manage the company�s DOE business. That includes responsibility for the four national labs Battelle manages or co-manages�Pacific Northwest, ORNL, Brookhaven and the National Renewable Energy Laboratory. Bill will continue as Lab director until a successor is chosen. In his position with Battelle, Bill will become a member of the UT-Battelle board of governors. The news caused a buzz in the surrounding community. Bill will leave in his wake a $300 million modernization campaign that has progressed with lightning speed, ORNL�s first �outstanding� rating from DOE, a Spallation Neutron Source project that has continued to be on time and on budget and a reorganized Lab with a clear agenda. The privately funded aspect of the nearly complete facility on the east campus will likely become a model of modernization throughout the DOE system. He�s taken a few pies in the face, but that�s usually been for good causes, such as the United Way. ORNL Reporter had a quick interview with Bill just after the announcement. With so much to hang your hat on, what is your proudest accomplishment? BM: The excitement that I see the Lab staff have over a revitalized ORNL. Where would you like to have made more progress? BM: We never really made the kind of progress I had hoped on cost reduction. Our indirect costs remain a challenge. In April 2000 you said nice things about the area and the people, and you became involved in the community. Did East Tennessee or East Tennesseans surprise you in any way? BM: Southern hospitality is real. How do they do it? 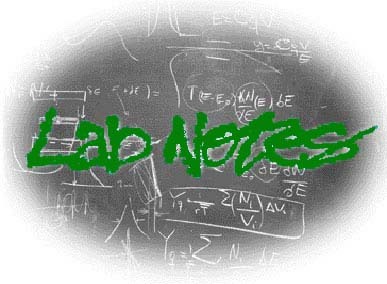 BM: Spend more time in the Lab (I was gone too much) and listen to the staff in formulating your plans.�B.C. Purchase cards�company-issued credit cards�are a wonderful thing, many ORNL staff members would agree. They enable quick and efficient purchases of low-cost items needed for work done at the Lab. The P-card program, which is managed within the Contracts Division, has streamlined the procurement process and reduced procurement cycle times dramatically. A P-card is also a tool for trouble if not used and managed properly. One national laboratory has already experienced the ire of its DOE customer, management upheaval and unfavorable publicity because of improper use of company P-cards. Proper management and accountability is the best way to avoid trouble. ORNL�s procurement organization administers the purchase cards and has implemented a controlled self-assessment program to help ensure that the Lab meets its obligation to spend taxpayer�s funds appropriately and efficiently. Scott�s auditing group is often asked to perform an independent check on the health of the program. At ORNL, more than 500 staff members (that number could soon decrease) have P-cards issued to them as a convenient way to procure routine, small-dollar commodity purchases priced under an established dollar limit�usually $2,500. Most staff members use them properly. To date, only one serious misdeed has occurred�an employee ultimately lost a job, was sentenced to five years probation and was ordered to repay nearly $11,000 for items bought (and resold) with a P-card. Scott says proper management and accountability is the best way to avoid that kind of trouble. Cardholders and their approving managers receive monthly reports�showing the vendors and dollars spent on P-card purchases. Those reports should be the objects of careful attention, if for no other reason than employees could be liable for losses. AMAS�s Gail Lewis says it�s important to keep good records, which makes things much simpler in case she�s called in to investigate purchases that may not look appropriate. Gail advises registering �sensitive purchases� (see sidebar) with the property management organization, as is the requirement. �Also, keep your records conscientiously and for the three-year required period, as a minimum. Don�t destroy records prematurely, even if the cardholder leaves the company or relinquishes his or her card for some other reason. Three years meets requirements; you certainly don�t want to destroy them after only a year,� Gail says. In other words, better safe than sorry. Scott notes some of the purchases that set off alarm bells include alcohol (not necessarily forbidden if government funds aren�t used), clothing and �split� purchases, which is when a series of purchases is generated to distribute the cost of an item costing more than the cardholder�s individual transaction limit. Buying a $10,000 microscope with four $2,500 invoices, for instance, isn�t allowed. P-card holders took a refresher-training course last year that provided clear guidance regarding responsibilities and what is and isn�t allowed with P-cards. In addition, the P-card manual has been rewritten and distributed to provide additional, more specific guidance. Scott credits the required training with heading off potential abuses. That sort of responsibility and attention to detail will help keep the P-card program alive. �We have adequate controls and systems in place,� Scott says. �However, individuals are not always following the requirements. If people follow the procedures and are responsible and accountable, the benefits of P-cards far outweigh the risks.��B.C. They�re he-re. Fire ants, those stinging, slashing ants feared throughout the Southeast, have been found on the ORR. A mound was discovered near the old guard station on the east end of Bethel Valley Road. Following their positive identification as Solenopsis invicta by UT etymologists, the area of the colony was roped off in preparation for a coming �shock and awe� insecticide campaign. Fire ants are an introduced species that, thanks to warmer winters, have been making their way north. They are aggressive, sting relentlessly and are prone to mass attacks when provoked. The South American import can harm livestock, humans and crops. Their mounds, which can reach about 10 inches in height and a foot in diameter, usually don�t have discernible entrances. Wartime is always a stressful time for those who have loved ones in the military service. Any notion that those are few and far between at ORNL and other area DOE facilities were dispelled in April when the Lab�s on-line news page, ORNL Today, asked readers with loved ones in the service to send in their names so that others could be aware. More than 60 soldiers� names were sent in from the ORNL Today readership, which spans most of the DOE complex. Most were involved in the conflict in some way, including on the ground in Iraq. Others were expecting to go or were holding down various forts all over the world. The list was suggested by Facilities and Operations� Valerie Conaway, who has a daughter and son-in-law in the service. Justin Petrillo, teacher David Taylor, Matt Bogen and Jarret Petrillo of New Jersey. Using outdated, inexpensive personal computers, a group of 13-year-olds have begun the process of constructing Westfield, N.J.�s, first supercomputer. Inspired and encouraged by the work of the Environmental Sciences Division�s Bill Hargrove and Forrest Hoffman on the famed Stone Soupercomputer, which was described a while back in Scientific American, twin brothers Jarret and Justin Petrillo formed the Linux Computer Clustering Club at Edison Intermediate School in Westfield. The club, supervised by Edison Science teacher David Taylor, includes a group of eighth graders. The Stone Soupercomputer and other Beowulf type computers are essentially desktop PCs that are linked together and programmed to operate in parallel. Working on a very modest budget, the New Jersey students have thus far managed to secure 17 PCs. Bill says he supposes the Stone Souper�s friendly Website makes them seem approachable, and they have �boilerplate� answers for most inquiries. But this example astonishes him. Bill is glad he encouraged them. �Maybe the most important thing I�ve done in my career is help these kids,� he says. The clatter continues at a modernizing ORNL. The first of the new private development buildings is nearing completion. �It�s on schedule � and we expect that we can begin moving into the building in early summer,� says Engineering�s Gerry Palau. The privately funded facilities are rapidly approaching the moving-day phase. New tenants will begin the migration this summer. The other two private development buildings�all three are part of a complex�are on track for completion in late summer. The state-funded Joint Institute for Computational Sciences building is now well under way with the steel superstructure rising from the former east parking lot. The fifth East Campus building, the Research Support Center, is expected to break ground in June, Gerry says. Work has begun on a landscaped plaza between Building 4500-North and the new east campus complex. The two complexes will be joined by a pedestrian walkway. With the considerable help of environmental management contractor Bechtel Jacobs, two new parking lots are on schedule for completion in late summer. They will be located at the old holding ponds, or surface impoundments, on the south end of the Laboratory. One pond has been filled for some time; the largest is being cleaned and is in the process of being drained. Upon completion, the lots will fill a critical parking gap created when the new construction replaced the east parking lot, as will about 60 spaces on the former south tank farm near the ORNL Cafeteria. More than 100 ORNL staff members recently received Significant Event Awards in recognition of achievements during the first half of fiscal year 2003. SEAs�lump-sum monetary awards of various amounts�recognize individual employees and teams for their contributions and achievement of significant goals or milestones in support of Laboratory goals and objectives. Although SEAs have been awarded at ORNL for several years, this is the first time that the award recipients have been widely announced. The Leadership Team reasons that the SEA program is a Lab-level program and, as such, resulting recognition should also be Lab wide. Nominations for these semiannual awards, which are presented in March and September, are reviewed and approved by their respective divisions and directorates before final selection by a Leadership Team subcommittee. Following are the most recent SEA recipients. Congratulations to them on their good work and contributions. Allison S. Baldwin, LeJean M. Hardin and Judy C. Neeley for their outstanding graphics support to the National Security Directorate. Gerald A. Harvey, Cynthia L. Wilson, Paul F. Gubanc, Dale A. Caquelin, Robert F. Peacher, Robert S. McKeehan, Michael L. Emery and Vickie S. White for their efforts in creating the Non-Reactor Nuclear Facilities Division. Faye S. Brewer, Marcia D. Whitson, Clarence W. Cross, Rolf P. Migun, Charles R. Vane and Steven D. Bridges for their work on the Building 5500 High Bay Cleanout. Elivra M. Hodges for outstanding environment, safety and health leadership in the NNFD Technical Support group. Mary J. Woods and Dennis W. Parton for development and implementation of the NNFD Budget and Work Breakdown structure. Owen W. Hale, Warren K. Thomas, Gregory A. Irby, Douglass G. Rowland and Charles E. Bruce for upgrading of the chilled water piping and pump systems in the Central Chilled Water Plant Facility. Lynn J. Degenhardt and Don P. Reid for their work on the ORNL Electrical Systems Upgrade Project. Hugh T. Christie for his work on the electrical utilities relocation at HFIR. Gary F. Galloway for addressing Building 7920 safety concerns. Michael E. Leach for achievements in fire extinguisher maintenance and repair. Doris J. Bray, Deborah J. Moore and Barbara F. Swails for improvements in operational effectiveness of the ORNL Visitor Services. Ella F. Jackson for her accomplishments while filling in as division training officer for the Craft Resources Division. Although SEAs have been awarded at ORNL for several years, this is the first time that the award recipients have been widely announced. Donald E. Welch, James G. Hansen, Howard D. Haynes, Daryl F. Cox and Rebecca J. Moses for their development of a new diagnostic instrument to evaluate the operational condition of fuel pumps on the C-141 aircraft. Douglas F. Craig, Larry M. Dickens and John T. Shaffer for the successful establishment of the Development of an Economically Attractive Gas Centrifuge Machine and Enrichment Process CRADA with USEC Inc.
Fusion Energy Division�s Bradley E. Nelson for his contributions while serving as a member on a DOE review committee. John F. Thomas, Michael D. Kass, Samuel A. Lewis, John M. Storey and Ronald L. Graves for their breakthrough on lean-NOx catalysis performance with hydrocarbon-selective catalytic reduction. Cecil V. Parks, John C. Wagner, Ian C. Gauld, Bryan L. Broadhead and Mark D. DeHart for initiation of a research program with the Nuclear Regulatory Commission to support the development of technical bases and guidance that would facilitate the implementation of burn-up credit into licensing activities. Roberto Lenarduzzi, Michael S. Hileman, William B. Jatko and Kenneth S. Weaver for delivery of a hardware and software system meeting the first major milestone in a CRADA with Tarallax. Alan L. Wintenberg, Steven S. Frank, Charles L. Britton, Kimberly N. Castleberry, Milton N. Ericson, William L. Bryan, Lloyd G. Clonts and Robert J. Warmack for fabrication of the full custom GS2 integrated circuit. William H. Hopwood and Stanley D. Moses (Nuclear S&T) for monitoring of Yugoslavian enriched uranium shipped to Russia. John M. Bailey, Philip A. Jallouk, John W. McKeever and Leon M. Tolbert (Engineering S&T) for their study to assess certain technologies for an equipment manufacturer. Donald W. Langenberg (Nuclear S&T) for a technical report titled, A Handbook for the Nuclear Suppliers Group Trigger List Annexes, distributed at the Nuclear Suppliers Group meeting. Nancy A. Markham (Engineering S&T) for the development of two internal applications�Coverage Report and Rogues� Gallery. Susan S. Johnsen and Laura W. Wagner (Engineering S&T) for their request for proposal submitted to the California Energy Commission. Thomas G. Thundat, Robert J. Warmack, Thomas L. Ferrell and Gilbert M. Brown for development of a technique for concentrating, moving and separating proteins using an optically excited semiconductor chip (Molecular Comb). Ying Xu and Dong Xu for achieving the fifth-best performance in the biannual protein structure competition using the prediction tool PROSPECT. Charles W. Hagan for draft comment response to the environmental impact statement for the destruction of chemical weapons held by the U.S. Army. Glenda F. Hamlin for outstanding administrative support and assistance on a series of research workshops. George Dodson, Alexander Aleksandrov, Tom Pelaia, Mario Giannella, Ernest Williams Jr. and Saeed Assadi for the successful commissioning of the SNS front-end systems. Michael H. Skonicki and John Mashburn for establishment of the SNS Metrology Laboratory for Mechanical Inspection and Calibration of Components. Xun-Li Wang and Camden R. Hubbard for approval of a new NSF International Materials Institute for Engineering Materials Research. Christopher A. Tulk for the publication of �Structural Studies of Several Distinct Metastable Forms of Amorphous Ice� in Science. Ian M. Anderson for his work on the Transmission Electron Aberration-Corrected Microscope development project. Raymond G. Boeman for development of a new program focal area in intermediate strain-rate testing. Mark E. Mathews and Howard H. Oberholtzer for their work on the High Flux Isotope Reactor fire hazards analysis. Lynn A. Boatner, to recognize his achievements as recipient of the Frank H. Spedding Award. Ariel A. Chialvo (Chemical Sciences) for new calculations of intermolecular interactions. Angela A. Blankenship (Metals & Ceramics) for handling of finances for the Automotive Propulsion Materials Program, the Heavy Vehicle Propulsion Materials Program, and the Light-Weight Materials Program. Jane C. Parrott (Creative Media) for her contributions to the ORNL 60th anniversary edition of the ORNL Review. Marcia D. Whitson, Mary D. Davidson and Tina J. Graves for sales of excess government-owned property using E-Bay. Walter P. Dykas, Carl E. Thomas, Gregory C. Hinkel, Mark A. Floyd, Rick D. Phillips, Susan E. Hicks, Suzanne W. Willoughby, James W. Pearce, Karen T. Barry, Dennis W. Everett, Charles D. Fisher and Chad M. Pfleger for cyber and network security process improvements. J. Kyle Johnson, Nancy Y. Wright, Kyle R. Spence, Debbie D. McCoy, Cheryl D. Hamby and Patricia A. Boyd for contributions by the Joint Institute for Computational Sciences working group. Vladimir A. Protopopescu (Computer Science & Mathematics) for contributions to Optimal Control. Watertown High School in Wilson County is the latest school to receive a $10,000 grant for science lab equipment upgrades from UT-Battelle. Rep. Bart Gordon and ORNL Community Outreach Manager Brenda Hackworth went to Watertown High school recently to see the new science lab equipment�microscopes, beakers, pipettes and other general science tools. UT-Battelle has given the grants to a number of regional high schools over the past two years as part of its science and math education outreach program. Most of the old home sites were bulldozed or burned. The piece on the Tower Shielding Facility area (No. 47, April 2003) raised some memories of my own. That is one of the more fascinating and diverse (in many ways) areas on the Oak Ridge Reservation. When I was here in the 1970s and the Atomic Energy Commission was much more involved with traditional ecological research, field ecology was a major forte. TSF is heavily karst topography, honeycombed with solution channels (sinkholes). Given the geology, it makes you wonder what kind of considerations were made regarding the actual location of TSF in that area. Probably remoteness won out over other considerations�Melton Hill Dam came along after TSF and that was a very rural, pre-Interstate-40 corner of the reservation. Because of the caves, it was prime habitat for bobcats. Several were trapped there and equipped with radio collars to determine their home range (500�750 acres, with males having the larger range), again as part of general ecological studies supported by the AEC. At that time there was a zinc-lined wooden box set up as a cooler. A pipe had been driven back into the crevice and very cold water ran into the box, no doubt serving other domestic needs on that really dry ridge top. There may have been a dug well topside, and one didn�t go stomping around old home sites for that very reason. Situated around the sinkhole complex were several ruins, one very large foundation and a couple of other smaller cabins. I�ve never followed up to see who owned this parcel, but I suspect it was a family unit. Also in the TSF area were literally miles and miles of chestnut rail fence. Rail fences were found throughout the reservation and were very helpful in reconstructing land use for ecological investigations (e.g., Walker Branch Watershed). Most of this chestnut rail has finally decayed or become overgrown, but many remnants can be seen in yards in the western Oak Ridge subdivisions and probably elsewhere. On the backside of TSF, up from White Oak Lake, there were some near record old-growth trees. Again, the relative remoteness of the area likely led to their being overlooked originally as the ORR, like the rest of the ridge and valley, has been logged repeatedly since settlement by European man. One chestnut oak comes to mind. It was so large that it could not fit on the saw carriage at the mill in Clinton. We needn�t go into why it was cut in the first place. A cross section of this tree resides in the lobby of ESD�s 1505. Most of the old home sites were bulldozed or burned but, again probably because of remoteness, there were some really well- preserved cabins (almost move-in condition in the early 1970s) along the shore of Melton Hill, accessible only by foot until the lake was formed. The walls were papered with old newspapers. I recall one such Knoxville paper announcing the inaugural flight of the Pan Am Clipper across the Pacific. As part of the Walker Branch Watershed study (Chestnut Ridge just east of the Spallation Neutron Source), we brought back one of the Walker children (in his 70s then) to help us reconstruct past land use on that homestead. It was his first trip back on the reservation since his family was removed. The joy at being allowed back on the family land was marked. He regaled us not only with land use history but also all the gossip about all the neighboring farmers. At one point he pointed to an old barn site, by then covered in honeysuckle, and admonished us �not to tarry� as it was always �snaky.� At about that time I looked down between my feet and sliding through the compressed honeysuckle was the biggest copperhead snake I had ever seen. I levitated several feet (it felt that way) into the air and before we could move on he pulled his 4-inch Barlow knife and felled a small red cedar, with it rendering the snake to the snake afterlife. The copperhead measured 42 inches, a huge size for a copperhead. Ah, the musings of an old field ecologist. But it is appropriate to reflect on the history, natural and otherwise, of land that now hosts some of the most advanced technology in the world. 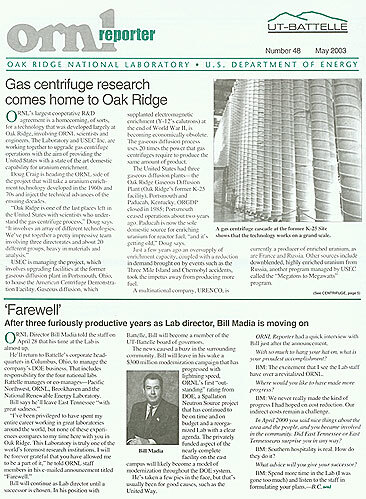 Former AEC Director Dixy Lee Ray many years ago suggested that perhaps �nuclear waste� might, many times, be better considered as a �nuclear resource.� A fantastic example of the resource nature of �stored nuclear material� was a front page article in the ORNL Reporter, issue #46, March 2003. The very useful medical isotope, Bi-213, is a direct descendent of ORNL-stored U-233. A better headline for this article might have been, �Lifesaving Resource.� Thanks for discussing the status and potential of Bi-213. Several Lab research staff members have published books recently. Corporate Fellow Tuan Vo-Dinh of the Life Sciences Division edited a new book titled Biomedical Photonics Handbook. The book is the culmination of a three-year effort to produce an in-depth survey of biomedical photonics from technology innovation experts and application specialists. Metals & Ceramics Division�s Amit Goyal is one of the editors of a recently published book titled Processing of High Temperature Superconductors�the proceedings of the Processing of High Temperature Superconductors Symposium held at the 104th Annual Meeting of the American Ceramic Society, April 28�May 1, 2002, in St. Louis, Missouri. The book was published by the American Ceramic Society. A book titled Ceramic Nanomaterials and Nanotechnology, edited by M&C Division researcher Michael Z. Hu and Prof. Mark De Guire of Case Western Reserve University, has just been published by the ACS. The Chemical Sciences Division�s M. Parans Paranthaman and the Condensed Matter Sciences Division�s Dave Christen have been appointed North American editorial board members of Superconductor Science and Technology, an e-journal published by the Institute of Physics, Bristol, England. The M&C Division�s Edgar Lara-Curzio has received the 2003 Richard Fulrath Jr. Award from the ACS �for outstanding contributions to ceramic science and engineering.� The award will be presented at the society�s annual meeting. An entry titled �Preserving Oak Ridge History: Oak Ridge National Laboratory�s 60th Anniversary Celebration (2002�2003)� has won the award of distinction from the East Tennessee Historical Society. Communications and Community Outreach�s Marilyn McLaughlin compiled the entry, which encompasses activities related to ORNL�s 60th anniversary celebration. The Chemical Sciences Division�s Mike Ramsey has been selected to receive the American Chemical Society�s Division of Analytical Chemistry Award in Chemical Instrumentation. The award, sponsored by the Dow Chemical Company Foundation, will be presented in September. Al Guidry, small business procurement subcontract administrator for the Spallation Neutron Source, has been named winner of the 2003 Minority Small Business Advocate of the Year Award, presented by the Tennessee Small Business Administration. Thomas Maier has joined ORNL as its latest Wigner Fellow. The Eugene P. Wigner Fellowship, a two-year appointment named for ORNL�s first science director and Nobel laureate, is designed to provide research opportunities for exceptional new scientists. Thomas comes to ORNL following two years of postdoctoral computational condensed matter research with Professor Mark Jarrell in the Department of Physics at the University of Cincinnati. To date, his work there on simulations of high-temperature superconductors has resulted in 10 first-author publications in top physics journals. Thomas earned his Ph.D. in physics at the University of Regensburg, Germany, in 2001 for work based on a theoretical description of systems regarding correlations between electrons, which netted him the regional power company�s �outstanding dissertation� award and the Roentgen Prize for young scientists that year. Thomas was awarded the M.S. degree in physics at Regensburg in 1997 and received a German Physical Society scholarship award. At ORNL, Thomas will work in the Materials Sciences Group of the Computer Science and Mathematics Division alongside Thomas Schulthess to, among other things, develop an abinitio method for strongly interacting electron systems; that is, a many-body approach that starts from first principles instead of a Hamiltonian model where the degrees of freedom are reduced to a few parameters. The Oak Ridge Institute for Continued Learning is offering 27 courses and six trips during its summer session, which begins June 9. The courses cover topics in art, computers, finance, history, language, literature, medicine, music, religion, science, social science and other areas. ORICL summer session trips include Ripley�s Aquarium of the Smokies and Arrowmont School of Arts and Crafts, the northeastern Tennessee and northwestern North Carolina geology trip, the Anderson County industry tour, dinner and a play at the historic Bijou Theatre, the Frist Center for the Visual Arts in Nashville and the Great Circus Parade and Midwest Highlights. A trip to Costa Rica with Elderhostel and ORICL is planned for April 2004. ORICL was established in 1997 to provide continued learning opportunities to mature individuals in East Tennessee. A summer membership fee of $40 entitles new members to participate in a number of courses. For enrollment information or a free catalog of classes, contact the ORICL office, (865)481-8222. ORICL is sponsored by Roane State Community College as a nonprofit program and is affiliated with Elderhostel Institute. Most courses are held at the RSCC Oak Ridge Branch Campus. ORNL is growing. This new feature lists new employees at the Lab. Welcome all. ORNL brings highly skilled and talented people to the Lab. That�s why the Human Resources & Diversity Programs Directorate has worked to revitalize the New Employee Orientation Program�to showcase ORNL as the employer of choice in science and technology research and development. From the time new employees receive their initial greeting from a Bethel Valley Road security guard until they finish their workday, HR&DP strives to ensure that they experience enough of the Lab�s culture to know that ORNL is a great place to work. Complementing the revitalized NEO process is ORNL�s upgraded visitor center (below), which gives visitors and new employees a cheerier first impression than the previous visitor reception area (above). NEO introduces incoming staff to the programs, services and resources they will need to make a smooth transition into the Lab. The program is customized to address the needs of all new employees, whether they be transfers, key management hires, non-U.S. citizens or students. Since the NEO revitalization project began in May 2002, nearly 100 newly hired employees have completed the orientation. In addition to NEO�s training aspect, new employees are also provided other resources to help them transition smoothly into ORNL life, including a canvas briefcase, an ORNL coffee mug and desk-organizing items. 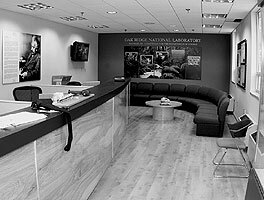 The training facility, a state of the art conference room, was created for this purpose and decorated with photographs featuring some key Lab activities. A new van is used for short tours around the Lab and for transport to the cafeteria.